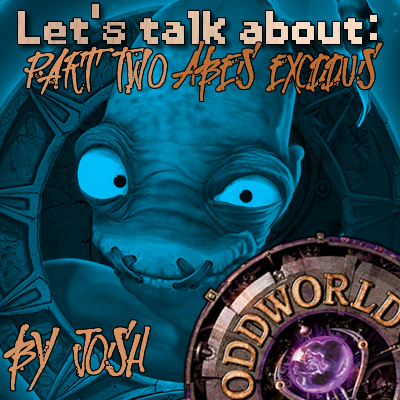 The story of Oddworld: Abe's Exoddus takes place right after the Good ending of Abe's Oddysee, where Abe has rescued 99 Mudokens from RuptureFarms and had been rescued from prison by BigFace. Abe sees a vision from three ghost Mudokens ("The Weirdos") who say the Glukkons are mining in Necrum, the Mudoken Ancient Burial Grounds of the Dead, for bones that will help them pull of an evil plan. So Abe sets off on another journey (only this time with a group of Mudokens) to Necrum. After infiltrating Necrum, Abe gets separated from the group and so once again he must travel alone through dark places to rescue his friends. Abe discovers what the bones are being made into a drink called SoulStorm Brew! 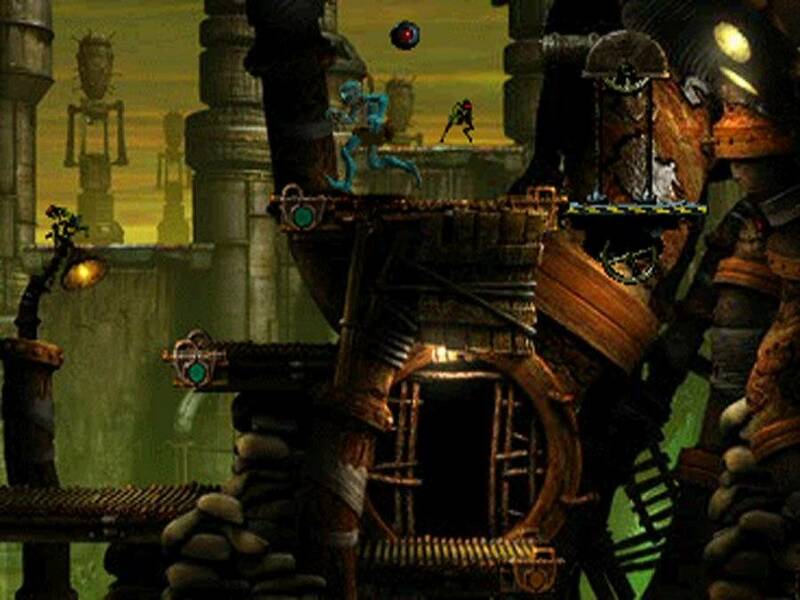 The game was a big step up from Abe's Oddysee thanks to several new improvements. The Mudokens have feelings and ailments to deal with, such as anger, sadness or blindness, as well as many others. This makes it much harder for Abe to communicate with them and help them escape successfully (the sad ones can become suicidal or the angry ones can beat each other up!). The use of the "Quick Save" option allowed players to save any time they wanted. You couldn't do this in the first game, and this was a life-saver! Most game reviewers said this was the best addition to the series. But most of all, the great story that we left behind in the previous games was back and rapidly unfolding in front of our eyes. This time Abe had to rescue 300 Mudokens from Necrum Mines, FeeCo Depot, Slig Barracks, Boneworkz and SoulStorm Brewery. Abe also narrated the game again and sounded a bit different (so I guess he went through puberty). There was also a new element to possession employed in this game as now Abe could possess and speak as Sligs, Scrabs, Paramites and Glukkons (in the first game Abe could only possess Sligs and talk to other Sligs and Slogs). So the game puts even more focus on possessing others in order to continue on your quest. You need to use these skills for opening doors, moving enemies away from you, or just killing them by making them explode. There were a few new creatures introduced like Leeches in the Mudomo and Mudanchee Temples that were a pain since they could kill you with just a few licks (or they could be bites) and Flying Sligs in Necrum Mines and Slig Barracks that were cool and fun to control since they could explore more of the area. As I said in the previous part about Abe's Oddysee, the music and opening cutscene is absolutely chilling, especially due to the music... but who could blame me, I was 9! Anyway, this is definitely the case as well in Abe's Exoddus. 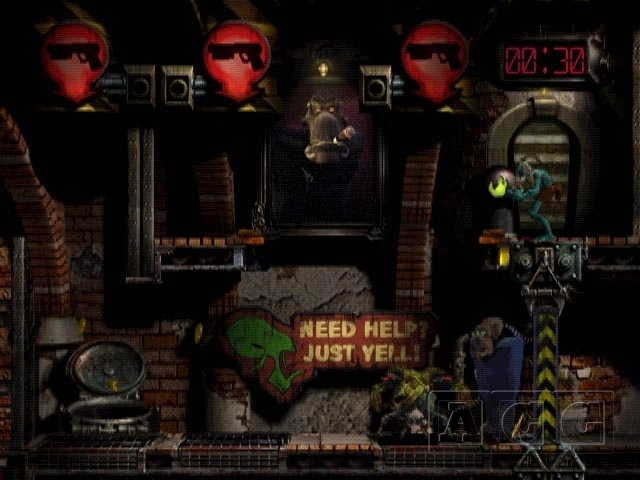 Overall, the voice dialogue for Abe and the game's enemies was much more comedy orientated and a bit rude, yet Abe communicated perfectly when possessing hosts. One funny thing that could be done was after drinking SoulStorm Brew, Abe could fart and then posses his fart and move it around... and then with a chant, it would explode like a bomb! Talk about the dangers of methane gas! So the awesome people at Oddworld Inhabitants worked their butts off in making this game even more huge than Abe's Oddysee. The game was also really difficult, but it sure kept me interested.